The North Carolina Distinguished Service Cross Awardees List is a 42-page list documenting the awards for North Carolina men who received the Distinguished Service Cross from the U.S. Army during World War I. As part of its attempt to document North Carolinians’ service in World War I, the North Carolina Historical Commission’s World War Records Collector and staff began transcribing official military orders, military unit lists, and press releases that dealt with North Carolina service individuals between 1919 and 1921. The goal was to make easy-to-reference sets of records or statistics on North Carolina’s role in World War I at a time when finding such compiled information was not easy due to the period’s technology. The War Records Collector and his limited staff used published booklets printed by the U.S. War Department with their official General Orders, produced during the World War I-era. 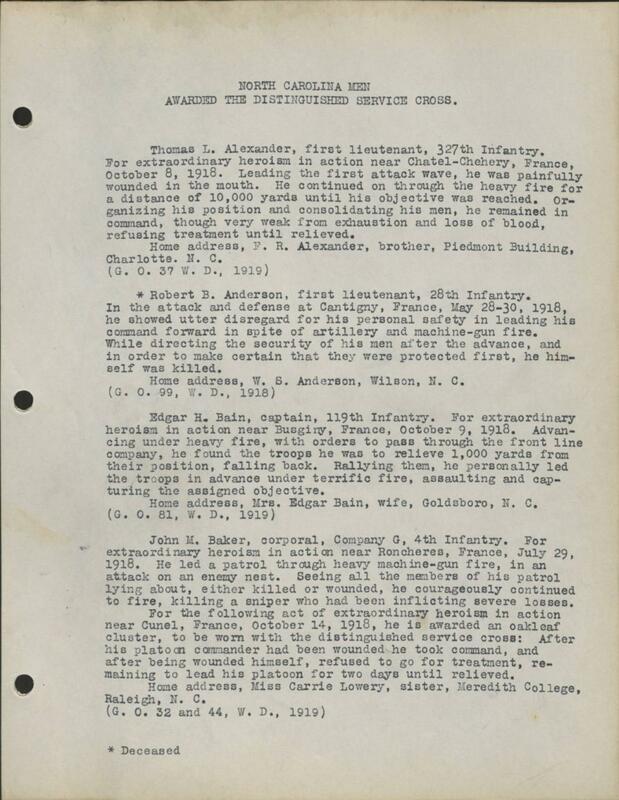 From this, they created a list entitled “North Carolina Men Awarded the Distinguished Service Cross.” The format of the award sketches in the General Orders that were copied by the Historical Commission contain the following information: person’s name; personnel’s rank and company; explanatory note of the event leading to the award; the service individual’s home address; and the reference to the General Order the excerpt is pulled from. For example, the following reference from one of the award sketches reads: (G.O. 37, W.D., 1919), which means this particular award was mentioned in General Order (G.O.) 37, from the War Department, published in 1919. This list is organized alphabetically by the service individual’s last name largely (though the last nine pages are not in a particular order as the list was continually added to). It is unknown if the list is complete, as it was a compilation compiled by hand over an extended period. The entire Distinguished Service Cross Awardees list is available for viewing online in the WWI digital collection on the North Carolina Digital Collections (NCDC), a joint effort of the State Archives of North Carolina and the State Library of North Carolina. 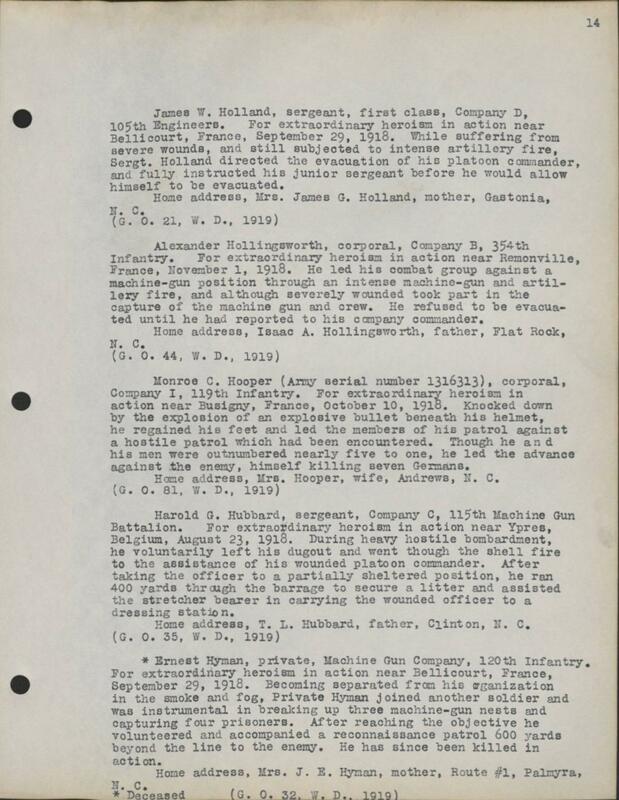 To see the original list, you can view it in the State Archives’ search room in the collection North Carolina Distinguished Service Cross Awardees List (WWI 88), in the WWI Papers of the Military Collection at the State Archives of North Carolina in Raleigh, N.C.